Summer has arrived early this year, and Columbia Empire Farms is here to help you usher in the sunniest months of the year. The Sherwood-based farm grows 900 acres of berries including Marionberries, Huckleberries and Blackberries that are now all ready to be picked and enjoyed. So kick-off the warm weather season by making a Marionberry cobbler or a drizzle some huckleberry syrup over your Sunday morning pancakes. With July 4th right around the corner, show your patriotism with dazzling red raspberries and vibrant blueberries on a shortcake topped with whipped cream. And when you’re heating up the grill, don’t forget to slather some berry BBQ sauce onto your baby back ribs. 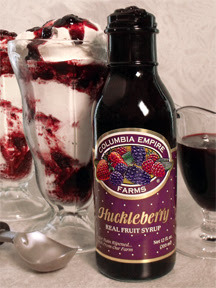 Columbia Empire Farms also offers fruit preserves and syrups, wine jellies, vinaigrette's, honey, hazelnuts, candy, and many other Pacific Northwest specialties. Gift baskets are available. For more information, or to order online, visit www.columbiaempirefarms.com. Columbia Empire Farms, established in 1976 in Sherwood, Oregon, cultivates 900 acres of berries and hazelnuts. Owned by Robert B. Pamplin Jr., this family farm produces its own preserves, jams, fruit spreads, syrups, butters, pie fillings, barbecue sauces, pepper jellies, vinaigrette's, honeys and hazelnut confections – all right on the farm using freshly harvested ingredients. 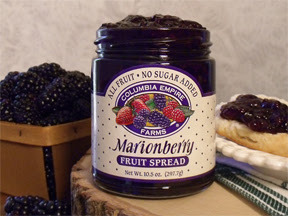 Whether it is marionberry preserves made with premium ripe berries or hazelnuts roasted to perfection and covered with handmade chocolate, Columbia Empire Farms thoughtfully crafts products that showcase the bounty of the Pacific Northwest. For more information or to order online, visit www.columbiaempirefarms.com.